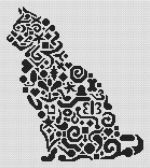 Tribal Cat from White Willow Stitching is stitched on 14/28 count white with a stitch count of 127w x 144h using DMC floss. A hand-dyed fiber of your choice would make this really unique. 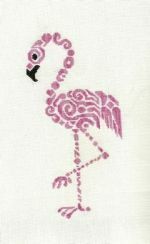 Tribal Flamingo from White Willow Stitching is stitched on 14/28 count white with a stitch count of 80w x 164h using DMC floss. A hand-dyed fiber of your choice would make this really unique.